7 3/4" x 7 3/4" wide. Just call (508)932-2574 and we can put anyone of our patterns on the face of this clock for you. Design of clock hands may vary. Runs on a single AA battery (not included). Can be hung on a wall or put on a plate stand. Looks great on a mantle. 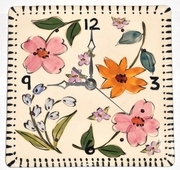 Add fun time to any room with this whimsical floral clock! 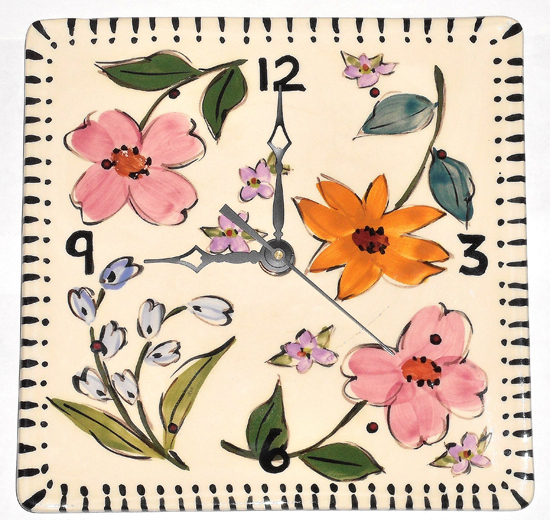 Just call (508)932-2574 and we'll be glad to assist you in putting anyone of our many patterns on this square clock.